There are days that come out of nowhere to remind you that it’s worth it. Yesterday didn’t feel like one of those days, but I’m confident today is. I can’t see the light at the end of the tunnel although they are celebrating. Because, unlike the seniors, I am still kickin' it at school through the summer. There’s no end in sight, and today’s dreary weather just adds to the grind that is the end-of-the year blues. Blues because Monday through Friday feels like a hamster wheel, and I’m ready for a change of pace. The day starts as I pop in the back of an early morning club meeting populated with kids from all grade levels and backgrounds. A certain giggly, curly haired senior excitedly hands me a gift. An intricately doodled envelope doodled with Crayola markers reads “Mrs. 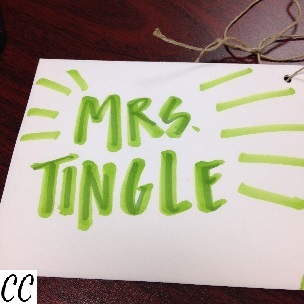 Tingle” and is tied carefully with twine to a gift bag. She is beaming as she gives me a hug and bounces away to embark on her last day of school. I open the bag to a mug and smell-good bar of soap, but, more importantly, the letter. The letter from this student gladly rejoices in her personal growth and thanks for me being a part of that. She praises me for listening to her, challenging her, and loving her (the last one is especially easy). The sweetest of sweet. It was enough to pull me out of the mire and finish strong. As the day goes on, I receive an email from a student I had two years earlier who transferred to another school and now another state. I hurriedly open an email attachment while putting on pause the 27 others ideas and projects bouncing around in my head and on my computer screen. I slow down. "You took a girl who didn't really care for school and made her want to see the world and beyond... You have changed my whole aspect on learning, and I wouldn't be where I am today without you." I am left stunned and gracious. I can't imagine any other career path to be as fulfilling as this one is to me. There is no part of me that wants a different routine. I'm thankful for it. I'm sure I'm not the only one in education who thinks this way. The unexpected fruit from the day in, day out grind of sowing seeds absolutely makes it worthwhile.